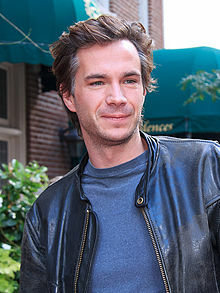 James D'Arcy (born Simon Richard D'Arcy; 24 August 1975) is an English actor. He is best known for his portrayals of Howard Stark's butler, Edwin Jarvis, in the Marvel Entertainment and ABC series, Agent Carter and murder suspect Lee Ashworth in the second series of the ITV series Broadchurch. D'Arcy also co-starred as Colonel Winnant in Christopher Nolan's action-thriller Dunkirk (2017). D'Arcy was born on 24 August 1975 in Amersham, Buckinghamshire, and was raised in Fulham, London with his younger sister, Charlotte, by their mother, Caroline, a nurse. His father died when he was young. He has family in Ireland, England and Scotland, with his English relatives based around the Midlands. After completing his education at Christ's Hospital in 1991, he went to Australia for a year and worked in the drama department of Christ Church Grammar School in Perth, which gave him an interest in acting. When he returned to London he applied for drama school. He did a three-year course at the London Academy of Music and Dramatic Art, completing a BA in Acting in 1995. During his time at LAMDA, he appeared in training productions of Heracles, As You Like It, Wild Honey, The Freedom of the City and Sherlock Holmes. His first appearances on television were small roles on the television series Silent Witness (1996) and Dalziel and Pascoe (1996), followed by roles in television films such as Nicholas Hawthorne in Ruth Rendell's Bribery and Corruption, Lord Cheshire in The Canterville Ghost, and Jonathan Maybury in The Ice House (all 1997). In 1997, he played Blifil in The History of Tom Jones, a Foundling. In 1999, he acted in the World War I drama The Trench as well as having a small role in the comedy Guest House Paradiso. From 2001 to the present, he played bigger roles and leading characters in the mini-series Rebel Heart (2001 as "Ernie Coyne"), The Life and Adventures of Nicholas Nickleby (2001, Nicholas Nickleby) and Revelation (2001, Jake Martel). In 2002, he portrayed a young Sherlock Holmes in the television film Sherlock: Case of Evil. In 2003, he played the role of Barnaby Caspian in the film Dot the I, and the character Jim Caddon on the series P.O.W. He also gained wider recognition when he portrayed Lt. Tom Pullings in Peter Weir's Master and Commander: The Far Side of the World (2003). He played in horror films Exorcist: The Beginning (2004, Father Francis), An American Haunting (2005, Richard Powell) and Rise: Blood Hunter (2007, Bishop). Apart from that, he appeared on television as Derek Kettering in Agatha Christie's Poirot's The Mystery of the Blue Train (2005), as Jerry Burton in Agatha Christie's Marple: The Moving Finger, as Tiberius Gracchus in the episode "Revolution" of Ancient Rome: The Rise and Fall of an Empire (2007), as Toby Clifford in Fallen Angel (2007) and as Tom Bertram in ITV's production of Mansfield Park (2007). He worked for BBC radio dramas such as Thomas Hardy's Tess of the d'Urbervilles, Bram Stoker's Dracula and Winifred Holtby's The Crowded Street. He played the role of Duncan Atwood in Secret Diary of a Call Girl. In 2011, he played the role of King Edward VIII in W.E., the second film directed by Madonna. In 2012, he played Rufus Sixsmith (young and old) in addition to two other minor roles in the independent film Cloud Atlas, as well as Psycho star Anthony Perkins in Hitchcock. In 2013, he played the role of Eric Zimit in After the Dark (other title: The Philosophers). In mid-2014, he played the role of Lee Ashworth in Broadchurch series 2, suspected of the murder of the two girls which almost killed Alec Hardy in the search to solve the case mentioned numerous times in Broadchurch series 1. He also appeared as the main villain in the 2014 action comedy Let's Be Cops, as a malevolent Los Angeles crime boss. Between January 2015 and March 2016, D'Arcy was a series regular in the television series Agent Carter, which shares continuity with the Marvel Cinematic Universe. In the series, he played Edwin Jarvis, the loyal butler of Howard Stark. He starred as a British Army Colonel Winnant in Christopher Nolan's Dunkirk (2017). Nominated for the Ian Charleson Award in 2002 (Outstanding Performance in a Classical Role) for Edward II. ^ "Biography". www.jamesdarcy.net. Retrieved 10 October 2017. ^ O'Connell, Michael (19 December 2017). "'Homeland' Adds James D'Arcy for Season 7". The Hollywood Reporter. Retrieved 17 January 2018. ^ Ausiello, Michael (19 December 2017). "Homeland: James D'Arcy to Play Agent From Carrie's Past in Season 7". TVLine. Retrieved 17 January 2018. Wikimedia Commons has media related to James D'Arcy.